Biffo, they don’t come better than this one, encompassing issues 11 thru 13 (February 1959 to June 1959) plus as a bonus the original MYSTERIOUS TRAVELER issue 1 (from 1948) and HORROR FROM THE TOMB issue 1 (from 1954) this volume from Charlton—PS’s third—is as good as it gets, with a roster of writers and artists that includes the truly remarkable and now late lamented Steve Ditko (the Traveler’s creator) together with Carl Burgos, Rocco Mastroserio, Charles Nicholas, Bill Molno, Matt Baker, Bob Powell, Alan Mandel, George Woodbridge, John D’Agostino, Cal Massey and Mannie Banks. If your mom tells you that you’re restricted to just one comicbook this week then this baby is for you, no question. Artists include Steve Ditko, Carl Burgos, Rocco Mastroserio, Charles Nicholas, Bill Molno, Matt Baker, Bob Powell, Alan Mandel, George Woodbridge, John D’Agostino, Cal Massey and Mannie Banks. This third volume features issues 11-13 from February 1959 to June 1959 of the Charlton Magazines publication of 'Mysterious Traveler'. 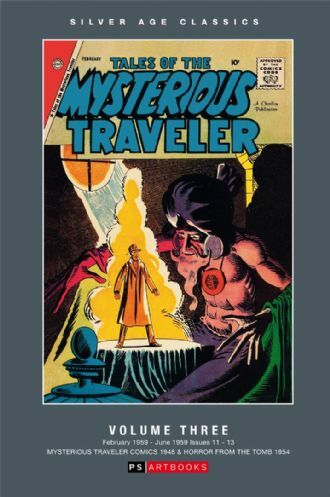 Also includes bonus issues of Mysterious Traveler Comics 1948 and Horror From the Tomb.